You will hardly find a better example of cargo cult science than flood geology (though baraminology and homeopathy are strong contenders), and the Swiss-born Ariel Adrean Roth is among its leading proponents. 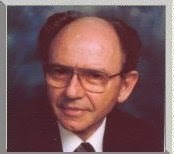 Roth is, in fact, a zoologist, and former professor and chairman of Biology at Emmanuel Missionary College (now Andrews University, a small, extremist, Pentecostal college offering non-accredited education that also hosts “creationist geneticist” Lane Lester) and at Loma Linda University – he is also the former director of the Seventh-day Adventist-run Geoscience Research Institute at Loma Linda – institutions that anyone who actually wants an educations would do well to stay very clear of. Roth is also former editor of the journal Origins, signatory to the CMI list of scientists alive today who accept the biblical account of creation, author of Origins, Linking Science and Scripture, and contributor to In Six Days: Why Fifty Scientists Choose to Believe in Creation. Roth is perhaps most familiar for his contributions to the side of loon in various court cases concerning creationism in public education, notably with “a precursor of” Michael Behe’s debunked irreducible complexity arguments (really just Paley’s old argument from design). In the early 70s he argued before the California Board of Education that creationism should be taught in public classromms (and with Leonard Brand, the current chair of of Loma Linda’s Department of Earth and Biological Sciences, he has tried to redefine “science” in a tortured manner to make it encompass creationism). He also tried his hand in McLean v. Arkansas Board of Education, trying to argue that evolution is a religion, too, but had to admit that “[i]f you want to define ‘science; as testable, predictable” then creation science is not really science and that there is no scientific evidence for the God of the Bible. His attempt to argue that evolution is unfalsifiable as well failed to impress since evolution is demonstrably falsifiable. Diagnosis: And so it goes. The list of delusional cargo cult scientists willing to reject all their training and knowledge when faced with something that challenges cherished religious convictions is a rather long one. Roth is a minor player, I suppose – and old – but loony enough to deserve mention. #1094: Karen Rowe et al.